Congratulations and welcome to GrabCAD Print! Before we get started, you may want to review our system requirements and the list of supported printers. This will install for all users on the computer and will require admin permissions, but an alternative installer is available. Read more here: Installing GrabCAD Print for multiple Windows users. If you are having trouble getting through the login at this page, your corporate firewall may be blocking Print from connecting to the GrabCAD servers. Contact your IT department, or email print@grabcad.com for assistance. Once the download is complete, open and run the installer. The file is called GrabCAD-Print-Installer.exe and it will be in your default downloads folder. It should take about 5 minutes to complete installation. Once it's finished, click the GrabCAD Print desktop shortcut to get started! 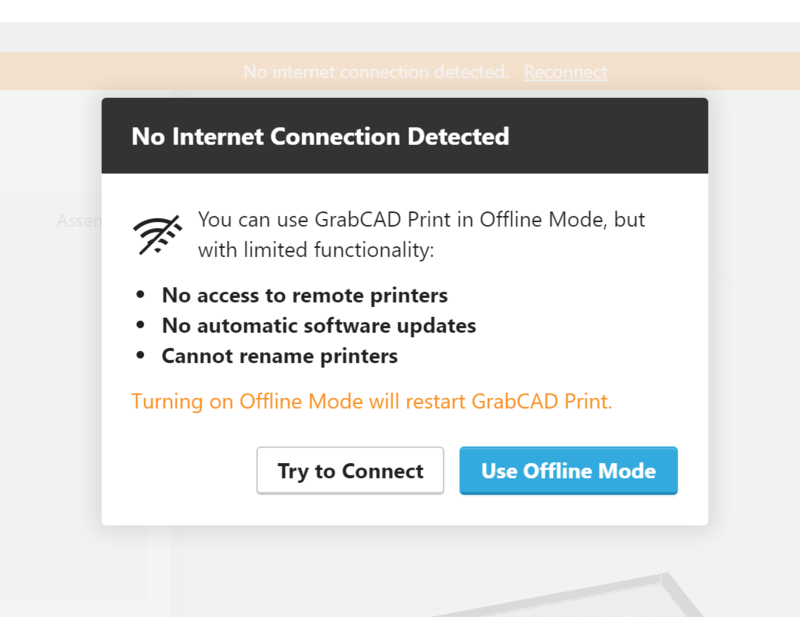 If you are unable to connect to the internet at any point while using GrabCAD Print, then you may skip signup. You can get a copy of the latest installer file from this direct link, and manually move it to the computer where you will install it. Before launching for the first time, we do a preliminary check for internet access, and if that fails we offer Offline Mode as an option. To force this to happen, all you need to do is temporarily turn off your internet connection while launching the app for the first time. You will be missing some great features of GrabCAD Print by working in Offline Mode, so please try to work with your company's IT team in order to get connected. You can read more about the limitations of Offline Mode here. If you are having problems logging in, check out the Troubleshooting Guide.